Amazon wants to be the brain -- and the heart -- inside your big-screen TV. 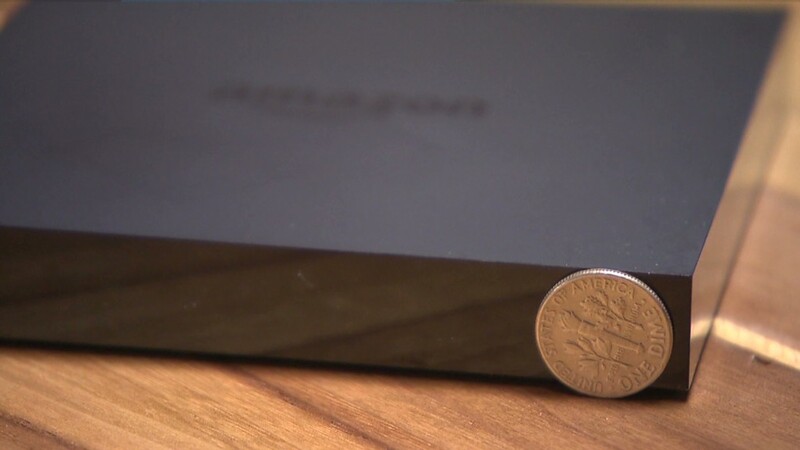 On Wednesday the company introduced a small black box called Amazon Fire TV that enables television sets to access Internet programming, including streaming shows from its Amazon Prime subscription service, and a giant library of video games. The device will cost $99 and will start shipping immediately. With it, Amazon will compete head-on both with streaming gadgets like Apple (AAPL) TV and console makers like Microsoft (MSFT) and Sony (SNE). All of these companies, in various ways and for various reasons, want to supplement -- and, over time, possibly replace -- the set top boxes from cable and satellite companies that sit in most living rooms. Amazon's Fire TV has several unique features, including a remote control with a voice recognition search feature, so a user can speak the name of a show, actor or topic and find that content. "Voice is the next platform battleground," the Forrester analyst James McQuivey wrote on Twitter. He noted that Microsoft on Wednesday announced its answer to Apple's Siri and Google Now, a voice-activated assistant feature called Cortana. 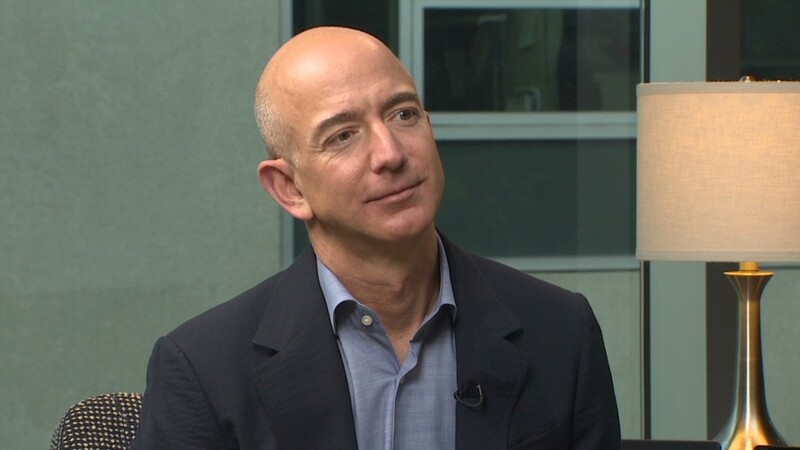 Amazon chief executive Jeff Bezos said Fire TV "has voice search that actually works." In a promotional letter on the Amazon home page, he wrote, "The old way of searching with a TV remote -- scrolling and clicking one letter at a time on an alphabet grid -- is painful. With Fire TV you simply speak the title, actor, or genre into the remote and you're done." A remote with a microphone won't be enough for Amazon to win the streaming device wars, though. At a press event in Manhattan, Amazon differentiated Fire TV by reading snippets of negative user reviews of other streaming media gadgets from Amazon.com. The complaints called out competitors like Google (GOOG) (maker of Chromecast), Microsoft, Apple, Samsung and Vizio by name. The company said it identified three big issues that make streaming devices "too frustrating:" inadequate search tools, sluggish performance and closed ecosystems of apps. Peter Larsen, an Amazon vice president called Fire TV "tiny" and "incredibly powerful." One feature, called ASAP, predicts what TV episodes a user might watch next, and "queues them up so that they start instantly," Larsen said. Fire TV may help advance Amazon's streaming TV ambitions. The company has started to introduce original shows, like "Alpha House" and "Betas," and has spent handsome sums of money to secure exclusive rights to other shows, like past seasons of Fox's "24." But its streaming service is a fraction of the size of Netflix (NFLX)'s library. To underscore the point that Fire TV doesn't just exist to support its Amazon Prime service, the demonstration showed off non-Amazon programs like NBC's "Chicago Fire." "It's the easiest place to watch Netflix," Larsen said pointedly. The event also included a highlight reel for Amazon Studios' original shows, including a second season of "Alpha House," which is in production now. "Customers are loving these shows," Larsen said. Amazon highlighted Fire TV's easy access to its children's programming interface, called FreeTime, and music and photos. In what amounts to an important move into gaming, Fire TV doubles as a casual gaming console; Amazon says it will have a library of thousands of games available to users, some free and others that exist as paid apps. Amazon also announced a gaming controller that will sell for $39.99. The company is investing in the game-making business through its Amazon Games Studio division. One game it previewed on Wednesday was a shooter called Sev Zero. "We've heard from customers that they want more from the games they play on streaming media devices -- games that are rich, unique and immersive. Sev Zero is the first step by Amazon Game Studios to address that challenge," Mike Frazzini, the vice president of Amazon Games, said in a statement.